It’s been a hot summer so far, and the humidity around here is OFF THE CHARTS. That’s probably why I haven’t blogged in a while… it’s just too hot to bake with the oven. My husband and I have been eating lots of fresh fruits, sandwiches, and salads. Just thinking about using the oven makes me sweat. 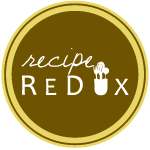 The Recipe Redux crew must have read my mind for this month’s theme. It’s time to “Beat the Heat” by using a small appliance, rather than an oven, to cook our food. I chose the microwave for this recipe, and I’m so glad I did. I love that I can use the microwave to cook my food while keeping my kitchen cool. A microwave works by generating heat through radiation. Heat is transferred to food through infrared waves, or microwaves. These energy waves generate heat when they hit food by agitating water, fat, and sugar. These waves aren’t as scary as they might sound. They are only used for heating, and they don’t get left behind in the food you eat. Larger, denser foods should be rotated once or twice during the cooking process to allow for even heating. Foods with higher water contents microwave at faster rates, because microwaves seek out moisture. Cover foods that are likely to dry out. The food will retain moisture, and you can prevent the food from splattering. Foods at the edges of the plate cook faster than those in the center. Place foods with irregular shapes, thin ends, and tougher portions to the edge of the cooking device. Put foods with higher moisture in the middle of the plate when heating your leftovers. Browning your food can be challenging in the microwave. You can sear foods quickly before putting them in the microwave, or you can baste meats before heating in order to get a brown color. You can also try rubbing foods down with paprika, or a deep-brown sauce, like soy sauce. Cooking desserts in the microwave can take less than 2 minutes. Do not disturb the cooking process once you start. Speaking of desserts, microwave cakes are so easy to make. You can mess up 15 times and still be finished within the time frame of cooking an oven-baked cake. Save yourself some energy by using your new skills to create my deliciously easy Pineapple Upside-Down Microwave Cake. Now beat that heat, and get cooking! Layer 1 Tbsp of brown sugar to the bottom of two 9-oz bowls or two 12-oz glasses (microwave-safe). Place a pineapple ring on top of each brown sugar layer. Add a pitted frozen cherry in the middle of each pineapple ring. Whisk the rest of the ingredients into a medium-sized bowl. You will have 2 extra Tbsp of brown sugar, which should be added into this batter. Split the batch in half, and pour it on top of the pineapple slices. Microwave the cakes on high for about 1 minute and 40 seconds, or until the cake is no longer runny. Let the cake cool for a moment, and the flip it onto another bowl or plate. Serve, and enjoy.